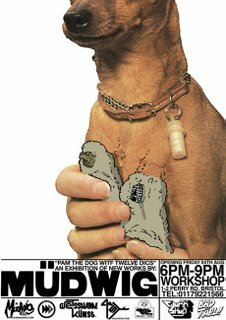 If you are down in Bristol this Friday be sure and stop over and check out a new solo exhibition titled " Pam The Dog Witf Twelve Dics" featuring all new works from street artist Mudwig Dans. The show opens Friday the 4th August at Workshop space from 6PM-9PM. dan sparkes a.k.a mudwig needs to spend some time with jeremy kyle(he has a rotting brain).